Sign up below to join the Ken's Furniture and Mattress Center's "Savers Club" then check your email for your $50 Gift Card good on your next item purchase of $499 or more*. When you join the Ken's Furniture and Mattress Center's "Savers Club" we will periodically send you emails notifying you of special events, sales, and discounts only available to club members. Be confident that we value your privacy and will never sell or share your information. Thank you. We look forward to seeing you in our store soon. 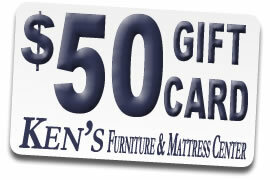 * The Ken's Furniture Savers Club Gift Card is worth $50 towards your next item purchase of $499 or more. See our store for additional details.